For his Eagle Scout Project, Alex Callahan of Troop 351 decided to focus on creating an accessible beautification project to highlight the area surrounding the flag pole at the DDRB. 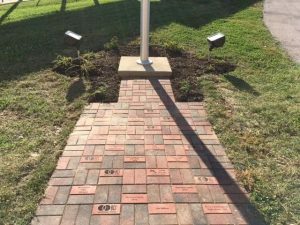 He chose to build an accessible walkway constructed of personalized bricks leading to the flag pole. The far side of the flag pole was then accented with Missouri native landscape plants. Under Alex’s direction, volunteers from Troop 351 excavated, graded, and prepared the foundation to lay the brick for the walkway. Detailed preparation and careful measurements ensured a perfect fit within its frame. Native Missouri plants were carefully researched and selected to provide low maintenance and visually pleasing accents to the project. Alex organized and managed the sale of personalized bricks to cover the costs of all materials for his project. With the service project completed, Alex advances to an Eagle Board of Review. It’s far too simplistic to say that an Eagle Scout Project is an opportunity for a Boy Scout to demonstrate leadership of others while performing a project for the benefit of his community. It’s the culmination of the requirements to get there and it’s a journey that takes years. So when Alex Callahan approached the DDRB about an accessible beautification project to highlight the area surrounding our flag pole for his Eagle Scout Service Project, the DDRB was eager to entertain his proposal. The plan is to create a wide walkway constructed of engraved bricks (available for purchase) leading to the flag pole that will include landscape accents of native Missouri plants. Alex explained that he chose this project to reflect his patriotism and provide a visually pleasing area that is accessible to people with disabilities. He chose the DDRB knowing that his project would have a lasting, positive impact on the people the DDRB serves and those who visit our public building. The DDRB is honored to have been selected for his project. As a requirement of his service project, Alex must raise 100% of the funds to cover all material expenses. To accomplish this Alex has set up a website link to purchase personalized engraved bricks that will be part of the constructed walkway. Bricks cost $30 per brick and allow three lines of personalization. To place an order go to http://polarengraving.com/EagleScoutProjectTroop351. Once Alex has met his fundraising goal, construction can begin. Over the past 29 years, the nation has seen movement toward inclusive classrooms, community living and better employment options for individuals with developmental disabilities to be fully included in society. So why is it that so many people with developmental disabilities still feel left out? Think about this. What creates a sense of belonging? What makes people with different tastes, talents and abilities come together and feel like they belong? For the most part it’s the feeling we get from others that we’re welcomed, accepted and valued. It’s being the recipient of an inclusive attitude. Throughout the month of March consider challenging your inclusive attitude in all your social interactions. Be encouraging, welcoming and engaging. Be an active listener who values what others have to say. Then use this same approach when interacting with someone who has a developmental disability. Having an inclusive attitude allows us to recognize and appreciate the multitude of abilities that each of us possess. It creates an environment that opens opportunities to develop authentic relationships at work, school and within our communities. Take the challenge this month. Let’s show our ability to see abilities in others. 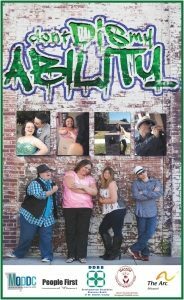 The Developmental Disabilities Resource Board (DDRB) of St. Charles County is pleased to announce our partnership with the Missouri Developmental Disabilities Council and People First of Missouri to promote this year’s developmental disabilities awareness theme of “Don’t Dis My Ability”. The St. Charles County chapter of People First of Missouri, a self-advocacy organization made up of individuals with developmental disabilities, is leading the campaign in our county for the sixth consecutive year. People First members are using the month of March to let others see the world through their eyes by raising awareness on the issue of ability rather than focusing on a person’s disability. People First—St Charles County actively present at local municipal council meetings, provide inclusive messages to elementary and high school students, and meet with state legislators to advocate for inclusive educational, employment and residential opportunities. The St. Charles County chapter of People First is known state-wide for its advocacy skills and knowledge of issues related to individuals with developmental disabilities. In furthering outreach efforts of the “Don’t Dis My Ability” campaign, the DDRB has made available 11” x 17” posters (above) and 2 1/2” x 6 1/2” bookmarks to the general public free of charge while supplies last. For information on how to obtain your free poster or bookmarks, contact the DDRB office at 636-939-3351, ext. 3106 or email Karen Craven at kcraven@ddrb.org. We encourage you to help us promote this year’s message of recognizing the abilities and strengths we all possess. Growing up with cerebral palsy in the 1950’s, Ray Layer and his family had no anti-discrimination laws to protect Ray from being excluded from educational, employment or housing opportunities. Some of those protections would come some 23 years later with the passage of Section 504 of the Rehabilitation Act in 1973 and again in 1990 with the signing of the Americans with Disabilities Act; 40 years after Ray was born. Many people born with disabilities during that era were institutionalized. But with strong family support Ray achieved what many of us now take for granted. He graduated, became employed, participated in recreational activities and socialized with friends. Ray, who has a calm and quiet demeanor, especially regarding his achievements, possesses a very real and unfaltering determination to push through life’s challenges. One of Ray’s biggest challenges began about four years ago when Ray was living with his mother, who was also his primary caregiver. When age related health issues required her to move into a nursing home, Ray moved there with her. The move was to be temporary while other arrangements were being made, but Ray experienced a very serious fall that required hospitalizations, surgeries and rehabilitation. His cerebral palsy made his rehabilitation difficult and lengthy. His stay in the nursing home ended up lasting three years. During this time Ray’s mother passed away, yet Ray remained committed to his rehabilitation. His sister invested in major home modifications for Ray to move in with her. Since the accident though, Ray has needed a motorized wheelchair to get around and he’s unable to assist with transferring to or from his wheelchair. With all he’d accomplished, he and his sister needed adaptive equipment to help safely care for him in her home. Fortunately this issue didn’t create another barrier to Ray achieving his goal of moving from the nursing home. Ray’s needs for a patient lift and an electric door opener could be accommodated through The Partnership for Hope Waiver. The Partnership for Hope Waiver is a voluntary partnership agreement between Missouri Department of Mental Health Division of Developmental Disabilities and Senate Bill 40 Boards across the state to equally share the state cost to provide the waiver. The Developmental Disabilities Resource Board of St. Charles County has participated in the Partnership for Hope Waiver since its beginning in 2010. The waiver serves eligible individuals with developmental disabilities who require $12,000 or less annually to access necessary services and supports that develop greater independence within their own home and community. 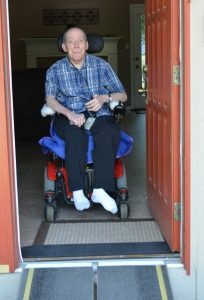 Through the Partnership for Hope Waiver, Ray was able to purchase the adaptive equipment he needed. Today Ray remains healthy and is once again enjoying living with family and being able to access his community. Now retired, Ray remains and active bowler and maintains contact with several life-long friends. For Ray, the Partnership for Hope helped open a door to home. As anyone who has experienced a job loss can attest, being employed is far more than earning a paycheck. It provides a reason to get up in the morning; a sense of being part of something outside of ourselves. It helps to keep us engaged with others. Rachel Meyer’s job is very important to her. She’s been employed with the same company for seven years. Her accomplishments there are a source of pride as she’s worked hard to earn her current position and rate of pay. She’s valued by her employer as a willing worker who provides a needed service for the company. In addition, Rachel has developed meaningful relationships with her co-workers and her work environment helps her to remain connected with other people. Being employed also means that she’s contributing to her community whether through the quality products or services she provides or through the purchases Rachel makes with her paycheck. Like many of us, Rachel’s job is a big part of defining who she is. Several years ago Rachel’s employment was in jeopardy when her parents developed significant health issues that prevented them from being able to provide Rachel’s transportation to and from work. With no public transportation available, Rachel was facing joblessness. Fortunately, the Partnership for Hope Waiver was available to Rachel. This innovative waiver service was created in 2010 as a way to shift from a crisis driven system to one of crisis prevention. The Partnership for Hope Waiver serves eligible individuals with developmental disabilities who require $12,000 or less annually to access necessary services and supports that develop greater independence within their own home and community. For Rachel, having transportation that allows her to continue working provides a multitude of benefits and prevents potential financial, social and mental health challenges people face while unemployed. Through the assistance of the Partnership for Hope Waiver, and the loving support of her family, Rachel continues to enjoy a balanced and fulfilling life. 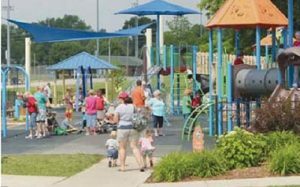 Brendan’s playground in O’Fallon has been recognized as one of “15 Favorite Playgrounds of 2015” by the website Play Across America. The fantasy-style, nature themed design with brightly colored, friendly looking bugs, mushrooms and other visually unique play structures was the collaborative effort of Unlimited Play, Cunningham & Associates and Cre8te Play. Opened in 2011 in the city of O’Fallon’s Westhoff Park, the playground is named for Brendan Schmitt, a young resident whose genetic disorder made it difficult for him to play with other children on traditional playground equipment. The playground incorporates ADA-accessible ramps connecting nearly all areas, steel slides that are suitable for children with cochlear implants (because the slides do not generate static electricity), a variety of swings so that children of different ages and abilities can swing together, outsized musical instruments on which kids can improvise tunes and a splash pad. On June 18, 2015 the Developmental Disabilities Resource Board of St. Charles County recognized Behavior Solutions, Francis Howell School District, Show Me Aquatics and Fitness, and United Services for Children with the Outstanding Community Partner Award. This award is in recognition for their 100% compliance to DDRB timelines for the past five years. A core value of the DDRB is accountability; striving for excellence to ensure quality outcomes and results for individuals with developmental disabilities living in St. Charles County. To that end, the DDRB uses various tools to measure an agency’s quality of service, such as accrediting bodies, audits, and satisfaction surveys, to name a few. As part of an agency’s contract agreement, this information is reported to the DDRB at specific intervals throughout the fiscal year. Timely reporting is vital to current and future planning for the DDRB. It allows us to work in partnership with our contracted agencies to ensure quality outcomes and results for individuals receiving their supports and services. And it provides an opportunity to work together to identify trends and/or service gaps that help plan for future needs. Working in partnership encourages innovative solutions that work to maximize our resources and efforts to more effectively and efficiently meet the needs of the community. The DDRB congratulates Behavior Solutions, Francis Howell Vacation Station, Show Me Aquatics and Fitness, and United Services for Children for their outstanding partnership. 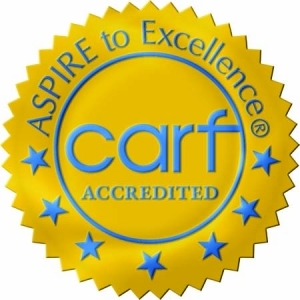 This is the third accreditation that the international accrediting body, CARF, has awarded Developmental Disabilities Resource Board of St. Charles County. This accreditation decision represents the highest level of accreditation that can be awarded to an organization and shows the organization’s substantial conformance to the CARF International standards. An organization receiving a Three-Year-Accreditation has put itself through a rigorous peer review process. It has demonstrated to a team of surveyors during an on-site visit its commitment to offering programs and services that are measurable, accountable, and of the highest quality. To view the full report click on the Public Meetings/Info tab. The DDRB is a public taxing district, commonly known as a “Senate Bill 40 Board” that enters into funding contracts with agencies that provide services and supports for individuals in St. Charles County with developmental disabilities. Oversight of the organization is by a 9 member volunteer Board of Directors appointed by the County Executive with the approval of the County Council. The DDRB Case Management program began in May 2006 through a partnership between the DDRB and the Missouri Department of Mental Health to reduce the overall caseload sizes and improve satisfaction of case management services in St. Charles County. The DDRB currently provides funding to 28 agencies. Funded services include adult day programs, residential services, advocacy services, supported day care, early intervention, transitional programs, respite, sheltered workshop, adaptive equipment, supported employment and recreation. The DDRB budget for fiscal year 2015 totals over 15 million dollars and all contracted services include measurable performance targets to meet outcomes as outlined in the DDRB Strategic Plan. For additional information regarding the DDRB, its Case Management program or programs it funds, contact Peg Capo at 636-939-3351. 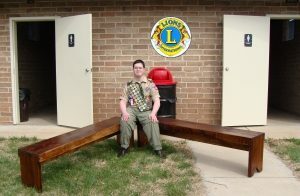 March 29, 2014 was a bitterly cold and windy day for an Eagle Scout service project, but it didn’t stop the 35 volunteers who worked under Grant Meyer’s leadership to build two benches for the restrooms at Harvester Lion’s Club in St. Charles. His mother Kim Meyer stated, “Grant’s biggest challenge that day was managing so many people. It was a great problem to have, but we certainly didn’t expect the numbers we got, especially with the weather we had. He kept everyone going though.” Grant, then aged 17 and diagnosed with Down syndrome, earned his Eagle Scout rank in August, 2014. Eagle Scout is the highest rank attainable in the Boy Scouts of America. Scouts must meet rigorous requirements and demonstrate that they live by the principles of the Scout Oath and Scout Law in their daily lives. Grant spent 44.5 hours planning his service project and met the same expectations as those of his non-disabled peers. What’s remarkable about Grant’s story is not that someone with a diagnosis of Down syndrome is capable of earning Eagle Scout rank; rather, it’s the depth of his community involvement and development of relationships that really speak to this young man’s character. 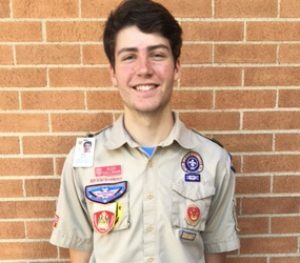 While Scouting is one part of Grant’s life, he’s also been involved with his church in addition to activities like basketball, karate and swimming. Throughout his school years he’s remained connected with established friends while developing new ones. Now at age 18, Grant is getting prepared for life after high school. 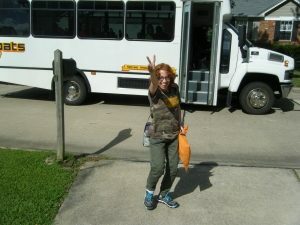 For the past two summers Grant has participated in the Summer Teen Employment Program (STEP) administered through Easter Seals – Midwest and funded by the Developmental Disabilities Resource Board of St. Charles County. His first summer was spent working at the Renaud Spirit Center, then at the St. Charles Pet Adoption Center in 2014. In both jobs Grant earned a paycheck while learning job skills This will help him when he seeks permanent employment in the future. The young lady posed the question while in their shared cooking class at Francis Howell High School with a poster stating, ‘There’s a million fish in the sea, but I’d be honored if you would go to prom with me?’ The invitation was accompanied with a decorated fish bowl containing a beautiful blue beta fish. He said yes. Thanks to his many friends Grant knows that inclusion means being welcomed and having a sense of belonging, not just going somewhere or doing something. Grant’s personal desire to be engaged with others and live an active life will no doubt lead to more achievements in his future.